Disclaimer: Pirates for Parties in no way implies to claim any rights or any kind of affiliation with Disney and any trademarked or copyrighted characters including, but not limited to Captain Jack Sparrow, as well as any intellectual property pertaining to the motion picture/s "Pirates of the Caribbean” which are TM and © (or copyright) by Walt Disney, Jerry Bruckheimer and its related entities. This web site and its contents are in no way affiliated with Disney, or authorized or endorsed by Disney Corp, Jerry Bruckheimer Productions, Johnny Depp, or any of their subsidiaries. Pirates for Parties is not affiliated in any way, nor do they by fact or inference imply to hold any rights or authorization, rights of association or sponsorship or endorsement of the use of any copyrights or trademarks as held by any individuals, or companies in association with any offer, including, but not limited to Johnny Depp, Jerry Bruckheimer, Disney and its related entities. The contents of this site are © the site's owners, all rights reserved. 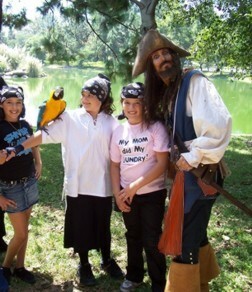 Pirates for Parties is a charity outreach of the Parrot Sanctuary. 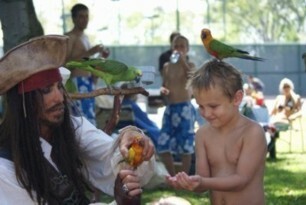 Any money recieved by Pirates for Parties goes to the Parrot Sanctuary, a charity. Brideport, Rhode Island, Washington D.C. Baltimore, Maryland, Virginia, Massachusetts, Boston, Cambridge, Hingham, Chicago, Illinois, IL, Denver, CO, Cincinnati, Ohio, Austin, Texas, San Antonio. We also serve the area surounding San Francisco, Fresno, Bakersfield, and Northern California. 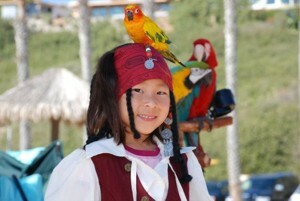 We will travel anywhere in the USA and we have pirate entertainers close by in your region. States. 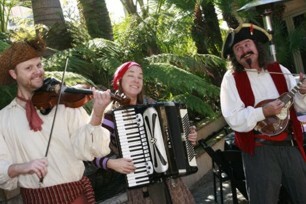 We also provide Pirate Props and pirate theme decorations, and your choice of pirate band for the ultimate pirate theme party. sailing ships, tall ships, yacht charter cruise, Catalina Island party and many other pirate entertainment and pirate party production. 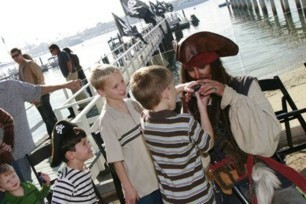 Pirates for Parties has served Southern California since 1999 and provides services all over the United States, including party planning, design, decoration, lighting, sound, entertainment, and exotic animals.